This saddle bag overall dimensions are 12.5" x 9.875" and can be mounted on either the right or left arm of your Pride scooter. It is perfect for a phone, keys and anything else you may keep in your pockets. 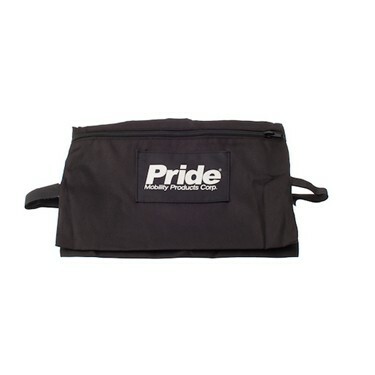 The saddle bag can be used on all Pride scooters. Note: Measurements on bag are for overall size not size of each pocket. Works really well for phone and wallet in small personal items. Not much else but if that is what you're looking for it works very well. Pros:Intrusive and useful for phone and wallet.